WiFire Remote - The One and The Only Wi-Fi Enable Fireplace Control! WiFire Remote, the newest addition to home automation, gives you the opportunity to monitor and control the heat and ambiance provided by your fireplace in those 'far away places' from any browser. You can now maintain the heat from your gas fireplace at your cabin in the woods, ensure a welcoming ambiance for your vacationing guests or prepare to come in from the blistering cold to a hot fire. WiFire Remote lets you start your fireplace from practically anywhere, with a push of a button. Put your fireplace controls right at your fingertips, no matter where life takes you. With a wireless network (Wi-Fi) available in the same location as the gas fireplace, WiFire Remote puts you in control from anywhere you have access to a browser. 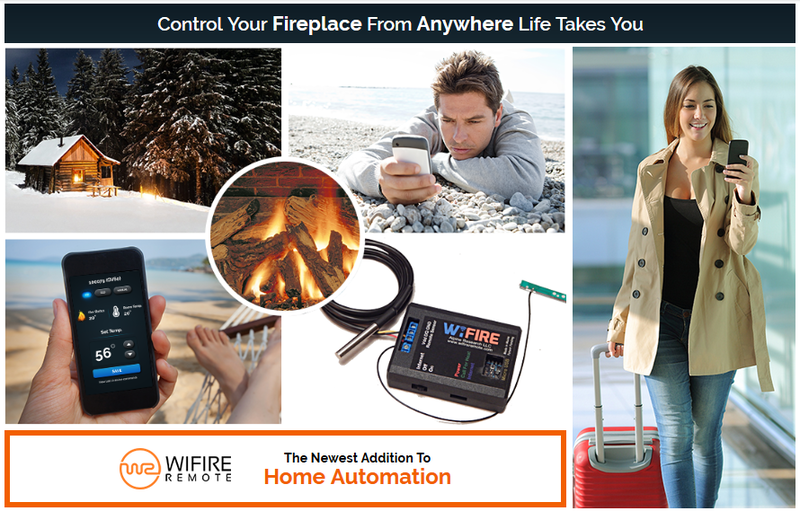 WiFire Remote is a Wi-Fi enabled gas fireplace control system that can be controlled with any mobile device (iPhone, iPad, Android) or internet connected computer (PC, Mac). Multiple fireplaces can be monitored and controlled from one smart device and multiple users can be set up with control permissions providing convenience and flexibility for both residential and commercial applications. WiFire Remote was developed by a dedicated team made up of hearth professionals, electronic engineers and software engineers, to bring this long awaited convenience to the hearth industry. The result is a simple to use, easy to install, compact and reliable means to control your fireplace from anywhere with internet access. We at Alpine Research are excited to bring you the latest addition to home automation and are dedicated to ensuring you are pleased with the WiFire Remote.